On your way to Mussoorie, stop by First Gear, best known for its stunning views, cold coffee and Maggi. It’s easy to miss this cafe, but ask anyone on the way up (there are plenty of small tea shops and dhabas around) and they’ll help. You’ll also spot a sign on the right side of the road that will direct you up a narrow, winding lane – where you can only drive in first gear (hence the name). Once you reach, you’ll find yourself at a wooden cafe with the nicest view. You’re here. 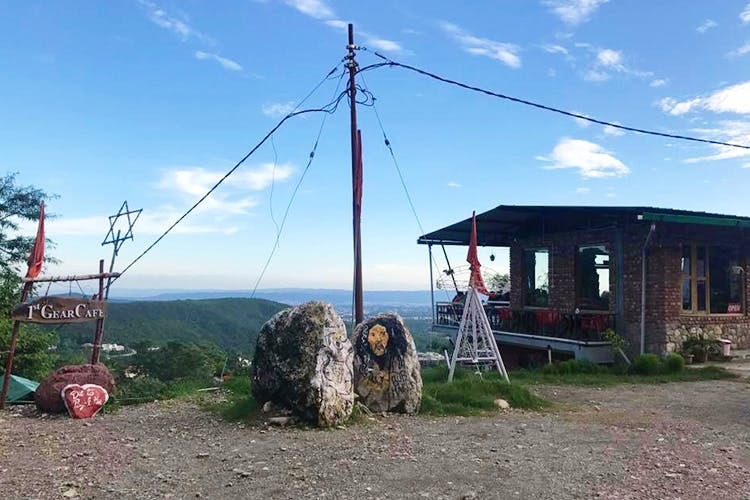 The cafe is literally at the edge of a hill, so if you grab a seat outside, you’ll find yourself staring at a view of Doon below and Mussoorie up ahead. It’s absolutely stunning at sunset, so we recommend you visit it then. If you’re going at night, they do up the outdoor area beautifully with fairy lights – it’s really one of the cutest cafes on the Mussoorie road. The cold coffee, chocolate shake and ice tea are serious life savers in this heat, and while the food isn’t incredible, you can’t go wrong with their Maggi and momos. They also have some really nice honey chilli potatoes, so it’s a great stop for some quick, simple snacks before you head up the road. The main thing you ought to come here for is the ambiance – the view is a real treat (if you don’t believe us, see the pictures for yourself). The next time you find yourself heading to Mussoorie, make sure you stop by this cafe for some coffee and a stunning view.